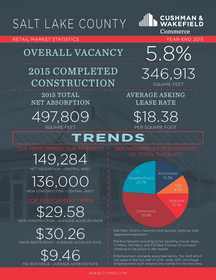 SALT LAKE CITY, UT--(Marketwired - Jan 7, 2016) - According to Cushman & Wakefield/Commerce, the retail market in Salt Lake County finished 2015 on a strong note with an overall vacancy of 5.8 percent compared to 6.2 at the end of 2014, leaving high expectations for continued growth in 2016. New construction kept a modest pace throughout 2015, adding 346,913 square feet to the market, which included the Salt Lake City Costco expansion of 85,000 square feet, making it the largest Costco in the world. Additionally, grocers along the Wasatch Front kept active with Smith's (Kroger), Wal-Mart and Sprouts expanding and putting pressure on lower-performing grocers. Entertainment concepts continue to expand across the valley, with a strong focus on movie theaters. Cinemark Theater in Sugarhouse was completely renovated and now offers luxury lounge chairs exclusively as well as new screens. The Cinemark Theater in Jordan Landing will also be following this trend by incorporating luxury suites to increase comfort and viewer experience. AMC is re-entering the market with a complete redevelopment of the former Carmike Cinemas into a luxury seating venue located at 90th and Redwood. Also of note, Top Golf in View 72, a cross between a sports bar and golf course, is expected to be open in the first half 2016. "The construction and new development Utah has seen in 2015 has yet again exceeded expectations," said Trigger Reital, managing director and market leader of Cushman & Wakefield/Commerce's Salt Lake City office. "The retail market in Salt Lake is in a phase of renovation and expansion, and will continue to grow in 2016. We are looking forward to another strong year for the retail industry." New development and redevelopment will continue to expand across the valley and shape 2016. The Family Center in Taylorsville is undergoing extensive renovations which include the addition of a Regal Cinema. Fashion Place will be adding an additional 50,000 square feet of new space, as well as welcoming the relocation of Macy's from Cottonwood Mall. See the attached infographic for a more holistic view. Cushman & Wakefield/Commerce, headquartered in Salt Lake City, Utah is an independently owned and operated member of the Cushman & Wakefield Alliance, with offices throughout Utah, Nevada, Washington and Idaho. The firm partners with its sister company, Cushman & Wakefield/NorthMarq to provide innovative commercial real estate solutions to occupier and investor clients, offering transaction services, capital markets services, occupier and investor services, and real estate advisory. Together the firms manage more than 52 million square feet of retail, industrial, and office assets, have annual revenues of more than $100 million, and employ more than 750 professionals. Learn more at www.comre.com, and www.cushwakenm.com. Cushman & Wakefield/Commerce and Cushman & Wakefield/NorthMarq are part of the Cushman & Wakefield platform.